The double bottom chart pattern can offer traders an opportunity to profit from the market with a healthy risk to reward. Here are some tips and tricks to get the most out of this pattern. This chart pattern is universally known but not many really know how to take advantage of this pattern to earn great rewards. You also need to identify the best double bottoms and not just any stock that form two lows. As traders, we want to only trade the best formations and not any stock that looks like it is forming some kind of pattern. What Is A Double Bottom? Everyone knows what a double bottom is. It is one of the most popular chart patterns in technical analysis. Easy to see in hindsight but difficult to spot as it is forming. However, everyone knows it in hindsight because it looks like a "W". It is important to note that the double bottom is a bullish reversal chart pattern that often ends a bear market in the index or stock. It is extremely popular because it can offer the good trader a nice risk reward trade. The pattern also gives the trader a 1st price target with the opportunity to make more as the stock moves higher. 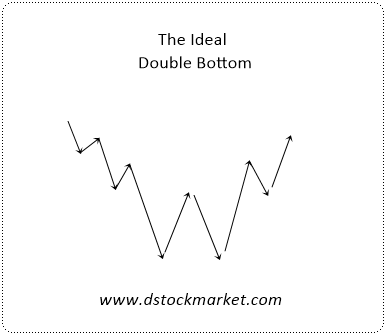 The diagram above is what the ideal double bottom looks like. The stock has a decline and then it forms two lows that are almost at the same price. The stock then rises to form a nice "W" looking pattern that brings the bulls in. 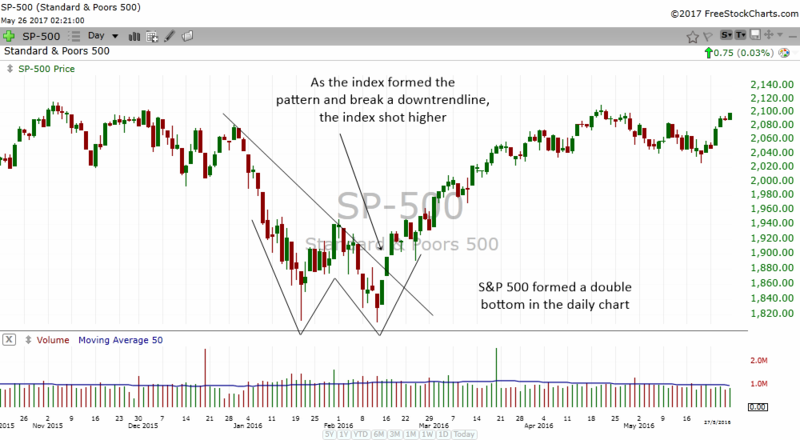 The double bottom pattern has ended many many bear markets and correction in indexes around the world. Later I will show you how powerful the double bottom pattern is with the many chart examples of major stock indices. The diagram above is variation of the double bottom. The stock declines, forms a low and then another low that is lower than the initial low. But somehow it has the strength to rise above the middle of the "W' and move higher. This surprises many people because the stock initially looks like it is just continuing a downtrend. The shorts have to cover when the stock rises and this in turn sends the stock higher. The lower low double bottom can usually be spotted with a bullish divergence using indicators that oscillate such as the Moving Average Convergence Divergence (MACD) or the stochastics. The above is a real life example of the double bottom chart pattern at work. Apple had a massive decline from September 2012 to May 2013 and this brought misery to many investors in Apple. 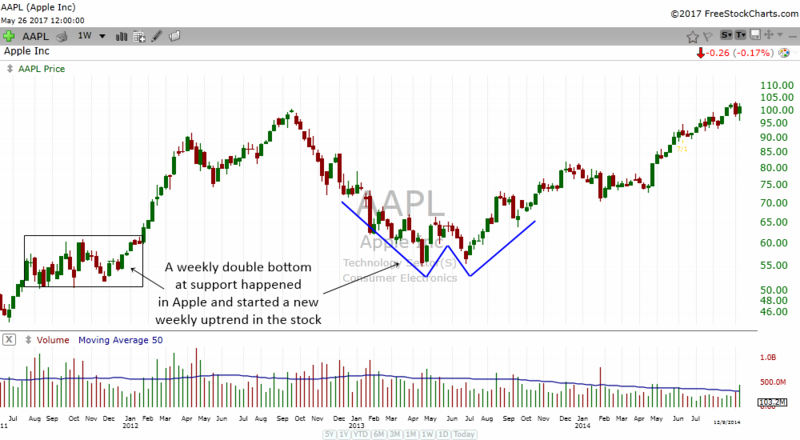 As the stock reaches the support area on the left, Apple begin to make a double bottom pattern which hinted of a bullish reversal in the stock. The stock bottomed and begin to start a new weekly uptrend thereafter. It is always good to start looking for some kind of double bottom when a stock or index hits an area of support. The smart trader will always be on the lookout and try to enter when the stock looks like it is in the process of forming the pattern. As the pattern begins to take shape, the trader can buy more and more. Sometimes I'm so amazed at how simple patterns like the double bottom can actually end a correction or bear market. Defies logic when you say that patterns can end a move. But of course, there is always an explanation to why chart patterns work. In my own experience, I found that the double bottom works very well for indices when they hit strong areas of support. 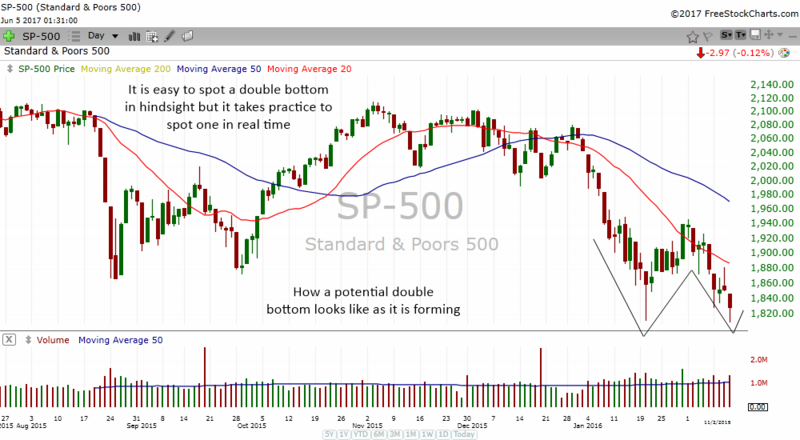 In the chart above, we can see how the S&P 500 formed a double bottom in February 2016. The pattern helped the S&P 500 to remain afloat and move higher. Once the index broke above the downtrendline, it gave hints to traders that the correction is over and the time to buy stocks has begin again. Recently in April 2017, the S&P 500 index once again formed some kind of a double bottom. It was probably not very obvious to most people but the fact that the index formed two lows which were at the same level told us it is a valid double bottom. At the same time, the index was forming a nice downtrendline to break. Once the index broke above the downtrendline, the index had a really nice few days rally. The double bottom pattern also appears in weekly charts. You can see how the Dow Jones Industrial Average formed a very very nice weekly double bottom that span a period of 6 months. This giant double bottom in the weekly chart ended the bear move and ushered in a new era of new highs for the Dow. The Dow Jones went on to make impressive returns and new highs. Notice that in January, February 2017, the Dow Jones was also forming a double bottom in the daily chart. 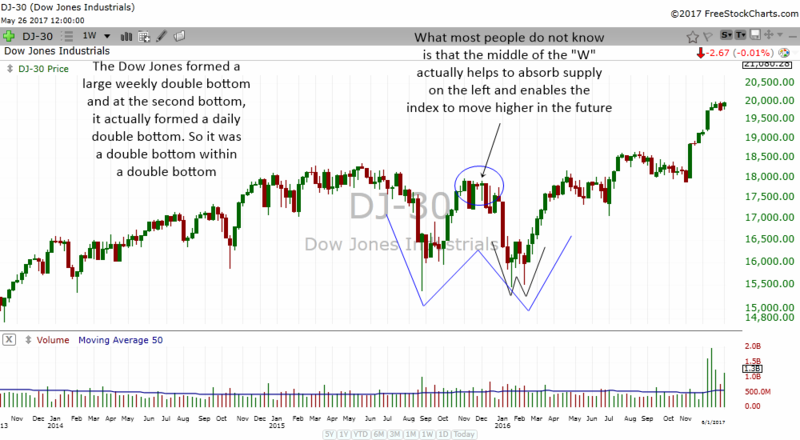 So, in reality the Dow Jones was forming a daily double bottom within a weekly double bottom. This was a very very bullish sign. It spelled double trouble for the bears but it was a double bonus for the bulls. Coupled with the presence of two weekly bottoming tails in the second low of the weekly double bottom, it was a powerful bullish reversal signal that traders should not ignore. When you have a double bottom supported by the 4 above criterias, your double bottom candidate can often be superior than other double bottoms. You have to choose the best double bottoms to trade instead of just trading any stock that forms this pattern. You don't need to have all 4 supporting criterias present but having most of them will make your trade more confident. The previous charts I have shown you have exhibited the first 3 flavor enhancers. Some double bottom formed at support areas, some broke the downtrendline as it formed the double bottom and some have bottoming tails. There are perhaps many more indicators that we can use as divergence indicators. But for me, I only use the MACD, the stochastics and Bollinger Bands. Having 3 is good enough. Sometimes I don't even use them all. Whenever we suspect that a double bottom is forming, we will put in these 3 indicators and see if there is any bullish divergence between price and the indicators. A bullish divergence happens when the price makes a lower low or same lows but the MACD and Stochastics indicators makes a higher low. For the Bollinger Bands, a bullish divergence happens when the first low penetrates the band but the second low stays within the band. All these bullish divergence tells us that there is internal strength in the stock. The 2 charts above shows the 60 min charts of Nasdaq 100 Futures. The index futures had a big drop recently and when they dropped near support I was looking for some bottoming pattern. The index eventually formed a lower low type of double bottom. When we put in the indicators, we can see how all 3 indicators diverge from price. This means there was internal strength in the Nasdaq 100. When the index traded above its 60 min 20 MA, it was a clear sign to traders that the index was going to move higher. Traders could have bought the index futures or the CFD as it cross above the 20 MA. Then just sit tight and ride the new 60 min uptrend higher. 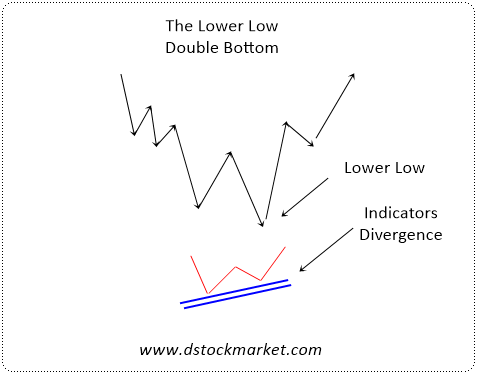 Trading the double bottom can be extremely risky for beginners. But for seasoned traders, they offer some of the best risk reward especially when the double bottom helps to form a new uptrend which can move very very high. 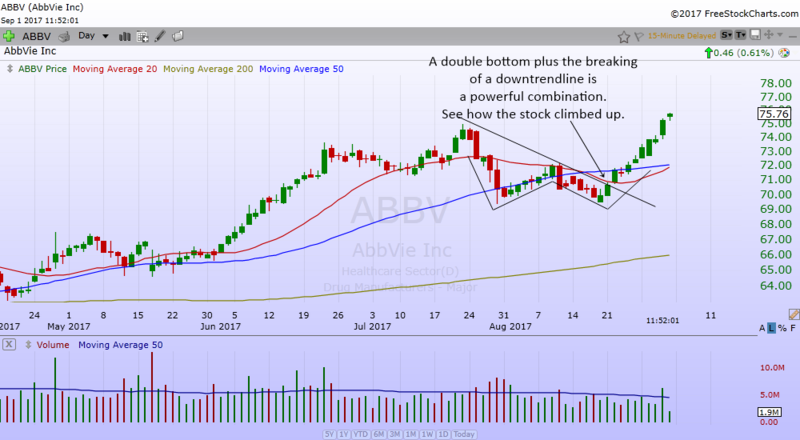 The chart above of ABBV is another new addition to this page. 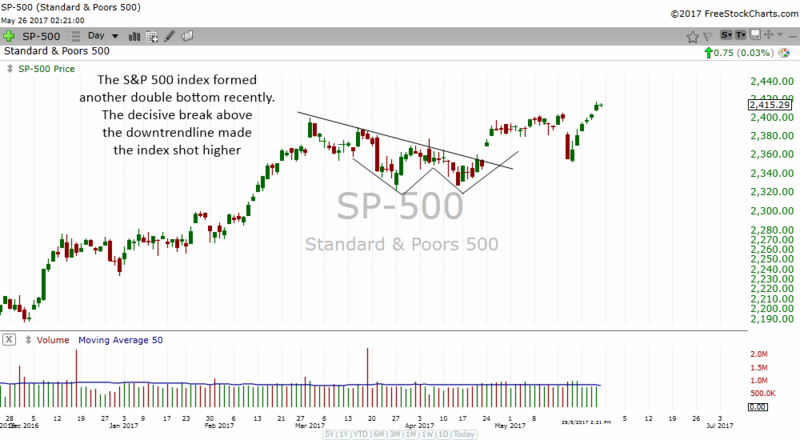 Recently the stock formed a double bottom and once it move from the second low, it broke higher and broke above a downtrendline. The fact that the stock begin to rise from the second bottom and broke a trendline is a powerful combination that tells the trader that the stock is likely to reverse the short term downtrend and move higher. Now that we know how to find the perfect double bottom, we need to know how to enter and exit the trade. It is a bit difficult to spot a double bottom as it is forming but with practice, a trader will be able to see it as it forms. In hindsight it is easy but one really needs to practice finding these patterns to be able to spot them. The chart above shows how a double bottom which has yet to finish looks like. You might want to look at dozens of double bottoms and try to see how it looks like before the pattern completes. That way, the next time you suspect a stock is about to form this pattern, you can easily spot it and trade the pattern. Let's talk about the entry. Once we have found a possible double bottom candidate, we want to choose the best possible entry points. There are lots of books which will teach you how to enter a double bottom. But I will show you how a flexible trader might enter the setup. In order to be flexible, you should not have only one entry point. You can have multiple entry points. Scaling in as the double bottom pattern forms is a good way to maximize your returns while distributing risks. If you only have one entry point, you may only be able to buy, say 50,000 shares. But if you have multiple entry points you might be able to buy up to 100,000 shares. By looking at the chart above, we can see that a flexible trader can have multiple entry points. Entry 1 is an aggressive entry. This is where the trader enters above the highs of the first green candle. We call it nibbling. The trader enters at a high risk but smaller shares. Entry 2 is where the trader enters the index again as the index breaks above a short term downtrendline. The amount of shares or contracts will be bigger. Entry 3 is where the trader enters the index when it trades above the 20 MA. 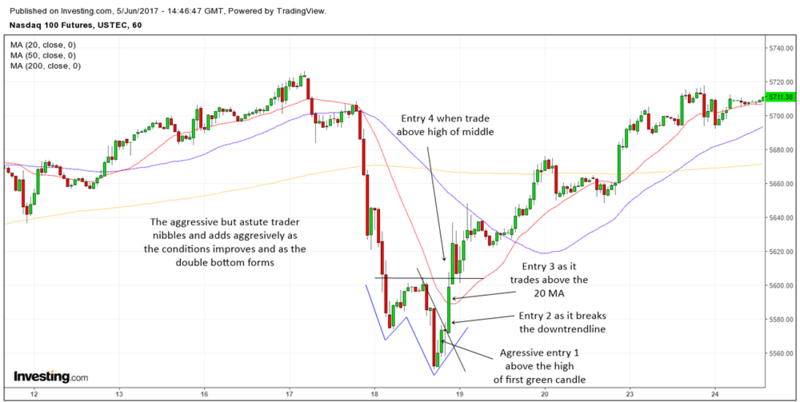 Entry 4 is where the trader adds to the existing shares or contracts and buy them when the index trades above the highs of the middle of the double bottom. The chart above is another example of how to enter and exit a double bottom pattern. As the pattern forms, you get ready to enter the index or stock. You can have a one point entry or you could have multiple entries to take advantage of this pattern as it forms. Some of the best double bottoms will have a break downtrendline at the second bottom. So you can draw this downtrendline for your own reference. The first entry would be when you suspect a second bottom is forming. Once a green candle forms, you can buy the index or stock once it trades above the highs of the first green candle. In the example above, the index went above the highs of the first green candle at the same time it broke above a short term downtrendline. This is a great combo and it increases the probability of success. Press the buy button and buy the first batch. As the index trades above its 20 MA, you buy some more. When it trades above the high of the middle, you buy a bit more. To set a target for the pattern, you take the height of the pattern from the bottom to the middle of the "W" and project it upwards from the middle of the pattern. That is your target. In the example above, the target is around 2100 for the SPX double bottom. It is good not to exit all at once because you never know how high the index or stock can go. This is especially true if the double bottom pattern happens in a long term uptrend. For example, a daily double bottom happens in a weekly uptrend support. The lesson here may sound new and goes contrary to what some books may teach you. But this is a sound trading technique which offers great risk/reward if you execute it properly. 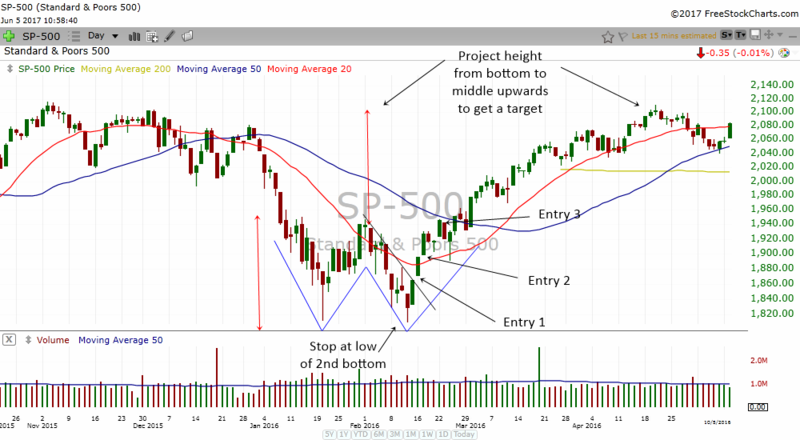 With multiple entries and multiple exit points you can catch the index or stock at almost the bottom, add more as it goes higher and take profits off the table while riding the new uptrend higher.